This necklace is made from a vintage gold-plated signed 4 picture Coro locket. On the top of the locket, is an acrylic cameo surrounded by prong-set rhinestones. 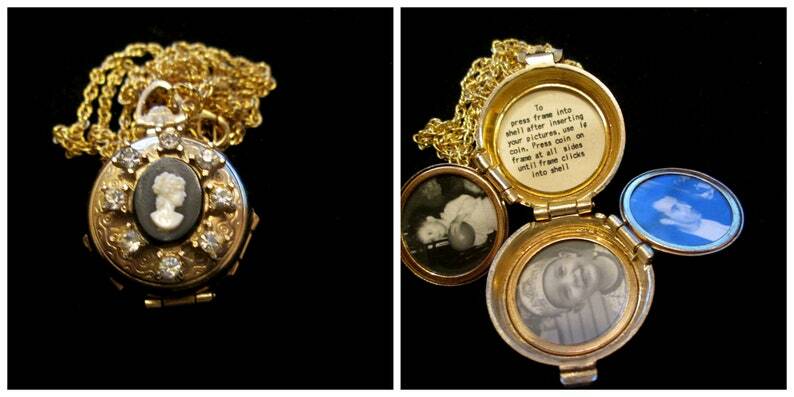 The locket opens to hold four photos under metal frames and 3 plastic lenses. All the photos can be removed and replaced with your treasure. This locket is hanging on a vintage gold-plated chain with a lobster clasp. The chain measures approximately 24 inches but can easily be adjusted upon request. The locket hangs approximately 1 1/2 inches from the chain and is approximately 1 inch in diameter. The photo portion of the locket is approximately 3/4 inch in diameter.